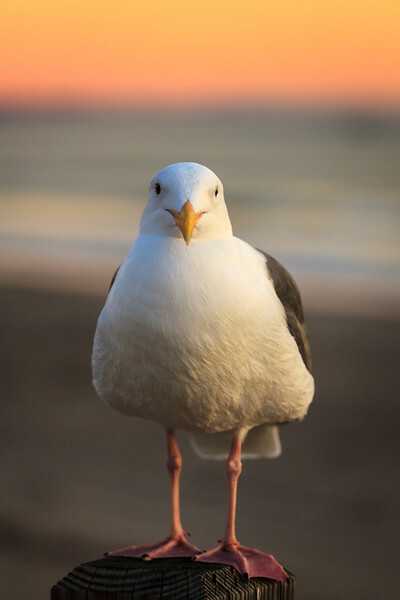 The California gull (Larus californicus) is a medium-sized gull, smaller on average than the herring gull but larger on average than the ring-billed gull, though may overlap in size greatly with both. Adults are similar in appearance to the herring gull, but have a smaller yellow bill with a black ring, yellow legs, brown eyes and a more rounded head. The body is mainly white with grey back and upper wings. They have black primaries with white tips. Immature birds are also similar in appearance to immature herring gulls, with browner plumage than immature ring-billed gulls. Length can range from 46 to 55 cm (18 to 22 in), the wingspan 122–137 cm (48–54 in) and body mass can vary from 430 to 1,045 g (0.948 to 2.304 lb). Winter plumage, California Their breeding habitat is lakes and marshes in interior western North America from Northwest Territories, Canada south to eastern California and Colorado. They nest in colonies, sometimes with other birds. The nest is a shallow depression on the ground lined with vegetation and feathers. The female usually lays 2 or 3 eggs. Both parents feed the young birds. They are migratory, most moving to the Pacific coast in winter. It is only then that this bird is regularly found in western California. These birds forage in flight or pick up objects while swimming, walking or wading. They mainly eat insects, fish and eggs. They also scavenge at garbage dumps or docks. They may follow plows in fields for insects stirred up by this activity. This is the state bird of Utah, remembered for assisting Mormon settlers in dealing with a plague of Mormon crickets. A monument in Salt Lake City commemorates this event, known as the "Miracle of the Gulls".